Although there are many things to consider after the death of a beloved member of family or friend, the following information details some of the more specific areas for consideration. Should you feel you need any further clarification, assistance in any aspect of the funeral arrangements or indeed answers to any general questions you may have just give us a call and we’ll help in every way that we can. Please contact W.S. Taylor & Sons Funeral Directors as soon as possible. We will help to guide you through this process. The death must be registered in the Registry Office for the district where the death happened. Our Funeral Director will advise you on which office you should go to. Call W.S. 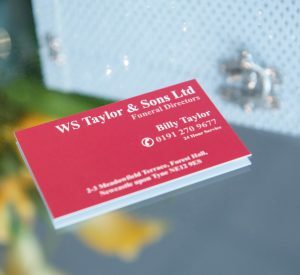 Taylor & Sons Funeral Directors as soon as you are able. There is no need to wait until after you have registered the death. We can start to discuss arrangements with you to find out the style of funeral you want and liaise with all the people who help the funeral take place. Why The Coroner Is Involved - There are certain situations where the coroner needs to be informed. We will liaise with the Coroner's Officer and keep you informed. Normally, the forms that we require for the funeral to take place will be issued by the coroner and either delivered to the crematorium or must be collected from the Registrar. You will need to register the death at some stage to obtain certified copies of the Death Certificate for insurance companies, banks, building societies and solicitors. These are currently £4.00 each and you can purchase as many as you need.